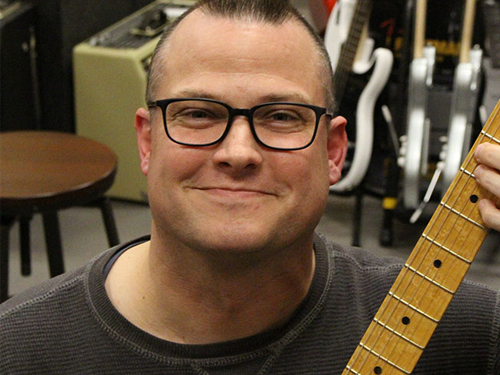 Greg Mansperger has been teaching at Music Land since 1999. Greg has always lived in the Baltimore area. He now lives in Carney with his wife, Inge, and his three sons. He has been playing guitar since 1985. He plays all styles of music but really enjoys 1960’s rock-n-roll, and 1950′s rockabilly. Greg has devoted himself to spreading the gift of music to as many people as he can. He began The Children’s Music Jam with some other musicians to give young families opportunities to sing and play music together. He has been teaching private guitar lessons since 1996. From 2004-2009 he was the worship leader at Timonium Presbyterian Church. He is currently teaching general music, K-8th, at Immaculate Conception School where he has been since 2007. Greg has a Bachelor of Music degree from Towson University where he studied Jazz guitar with Sheryl Bailey and Steve Herberman. He also studied classical guitar with Michael Decker and Mary Claire Ingalls. Greg has performed in many groups in the Baltimore area including: Ten Directions Jazz Group, No Flies On Nigel, and his new group The Fifty 7’s. He can be heard on many recordings including: jazz, rock, punk, and children’s music CD’s.